Footwear design always requires a very keen sense of perfect line and balance supported by a creative flair and sense for fashion trends. Limited only by the shoe lasts parameters and a fair share of footwear technical restrictions, the designer can let their imagination go wild. Within this breed of designers there are a few very few good safety footwear designers. Like all functional footwear, safety footwear requires a different skill set than that of the run of the mill footwear designer. Understanding the operational environment in which the footwear is used is absolutely essential when designing safety footwear. Lack of this understanding can only result in bad safety footwear. If you want to know if the footwear is good you can test it through all the traditional systems. It can be guaranteed you that you are merely testing materials, components and manufacturing quality. The actual test for safety footwear is to determine who developed it and who had the final say. If it was the managing director, accountant or salesman the shoe has failed the first test. If it was in the hands of an experienced safety footwear designer it is worth the wear trial. I have never designed a safety shoe without spending a good few days in the environment in which it has to be used. Fortunately my career had me spend a few years in the earth moving and mining equipment repair business, which subjected me to hours in these harsh environments of chemicals, mud, coal, water, fire, sparks, extreme heat and sub-zero temperatures. This made me fully understand and experience badly designed safety footwear - the hard way. My first experience was to buy the best brand, which cost me an arm and a leg. I ended up with blisters in places I never thought you could have blisters. My feet ached and burned from hours on ladders and in kneeled positions; later I even had smelly feet for the first time in my life. This was when I went to a friend’s factory and made my own pair of safety boots, which comfortably lasted me the rest of my career in the industry. Having designed footwear for the top safety footwear brands in Africa of which most are exported to Africa and Europe, seeing what some people put into the market raised in me many concerns. The process of designing a functional shoe takes months of research into its intended use, multitude of prototypes and testing, and as many wear trials. The safety shoe considerations mostly lie in choosing the sole, upper material, upper style and sometimes the toecap. The sole takes the most time to develop, with considerations of tread patterns and the materials or combination of materials to be used. With hardwearing, lightweight, heat resistant polyurethane available to us as sole materials we don’t have major problems deciding what materials to use. When price is an issue, we need to reconsider and apply other materials very carefully, with due consideration of the work environment. The tread design has two main factors that influence it. One is the slip resistance needed, as in the construction environment, and the other the resistance to collection of grime, as in the food industry. The cleaner the shoe the less grooves it has, and therefore the less traction it has. These issues are a continual challenge for the designer, as he has to find the sweet medium between the two. In certain circumstances, as in the instance of abattoirs, we need as little possible grime holding onto the sole, but we are working in a wet slippery environment so the designer has to determine where to draw the line. In other circumstances the designer has a far more precise framework to work on and concentrate on, either traction or cleanliness. An issue that the wearer might not always be aware of is that the design layout of the treads on the sole is not just for decorative purposes. The way the tread is designed is of utmost importance to the use of the footwear. All materials used in footwear have the tendency to tear on a sharp grooved edge when flexed. For this reason the edges of the flex area should always be rounded on the inside of the grooves, thereby releasing tension over a wider area of the corner end and not at the sharp bend. This area should also allow flexibility, especially for welders and other workers who work in kneeled positions. Again comes the problem of finding a balance between flexibility and having enough sole thickness to protect the foot. The type of toecap, or lack thereof, is based on not only the environment, but also on legal requirements. One of the biggest challenges for the safety boot designer is to develop safety footwear with a toecap that does not hurt. This requires a last and toecap with the correct allowances for the linings to protect the toes against the steel toecap incase they touch. Ending off a 3mm thick steel toecap without it showing off massive grooves across the vamp of the shoe or even worse, it digging into the wearer’s foot, we come up with a range of innovative ideas such as tapered rubbers and foam. We are continually trying to develop lighter weight toecaps and foot guards to conform to safety regulations. These protective measures are not always limited to toecaps, but sometimes also footguards. The upper materials and styling are based on the environment and protection needed. Price mostly drives the materials we use in safety footwear. When a brand can fetch the price, we have the luxury of using superior upper materials, but on the bottom end designers are often forced into using the corrected grain pebble print, which is usually a leather split or substandard leather that is pigmented and printed. We usually keep this footwear as simple as possible with as few seams as possible to keep the price down. From a designer's perspective we obviously would like to use more creative materials, but the market mostly requires the cheaper versions of ‘re-worked’ leather. It is a delight for any designer to work with full grain or corrected grain leathers. These leathers just provide a far superior product because the full strength of the leather is present in the upper surface. It also has good breathability if the surface has not been tampered with too much. The longer the shoe is worn and polished the better it gets; whereas the splits tend to weaken the longer they are worn, and can break if exposed to water. I have found from experience that the full grain leather footwear stands up to most conditions better if it is cleaned and polished regularly. It also performs well in hot and cold environments, keeping internal temperatures constant. The styling on safety footwear is mostly done for aesthetic appeal. The perfect safety boot upper is one piece of full grain leather with a bellows tongue (one piece tongue attached to the facings). This construction has no exposed seams that can burn, scuff or let water in. It also has no seams to hurt the foot. Vanity, however, is a major player in today’s society, so we have to make the boots and shoes more exciting, adding more seams, colours and stitching. Perhaps I’m just of the older generations of shoemakers, but I strongly believe in the benefits of leather-only footwear. I remember designing hiking boots for an age old brand. These boots were made with one piece upper leather and a lining from a split, which was thicker than the upper full grain leather. We received letters and even boots from people who have been wearing them for more than 20 years and climbed Mount Everest in them and wore them to trek through the Amazon. My own pair is more than 12 years old and will definitely make it to 20. We often think that technology is the best, but we must not forget that in footwear it is only mimicking the best. This prompted me to develop a stitch down boot with steel toecap under the same construction for a client, which has proven its worth, but as with all other good things, price was an issue. The synthetic materials and meshes we put into safety boots today may give immediate comfort and satisfaction, but they do not last. Leather linings, on the other hand, do need to be worn in but once done they mould to the foot shape and become something you could wear to work, polish, and then wear to church. In this process of designing modern safety shoes the designer again has to consider a multitude of facets as mentioned above, such as price, culture, fashion trends and most importantly the environment. Once a last and sole are developed we are restricted to the use of this on a range. The trick is to keep things as simple as possible and still create a unique look. A large part of this styling is contributed by the soles side profile, as the upper styling needs to conform to this. Within these boundaries we design a multitude of rough sketches: some good, some bad. We take these, select the best and start adapting them to more practical safety footwear. I generally concentrate on keeping as many of the seams facing downward to eliminate water build-up on them, which will eventually seep into the shoe. The tongues are always bellows to prevent water, sand or welding flux entering the shoe. The openings I keep as far forward as possible to allow for wider feet to enter easily and also the shoe to be laced up tighter for narrower feet. The vamp/flex area of the shoe I keep free of seams to allow easy and pain free flexing. Padding around the tongue and collars is also of great benefit in terms of comfort and also because it helps to prevent foreign items from entering the shoe. I like keeping the mesh lining away from the edges and instead use the polyurethane linings here, which are far more resistant to wear and welding flux. Then we have the exciting market of the ‘gumboot’. When it comes to their design, this is a field of expertise that, unless you know what you are doing, I suggest you keep out of. I have seen companies lose a small fortune in mould costs, taking advice from Orthotists and other such wise men. There is a saying in the South African dialect Afrikaans that can be directly interpreted as “shoemaker, keep to your last” – this is where it could not be truer. The most important issue regarding the safety boot is the fit and must therefore always be based on a known last shape. Due to the high cost of a set of moulds, when designing a gumboot one must always build-in versatility, looking far into the future to what might need changing. We usually break our design into a shoe, an ankle boot and a calf boot, enabling us to use the same base mould, just adding sections as required. These sections can then also be changed to change the boot entirely, for example, you can change the sole mould section to give the boot more grip. The boot must also be designed with careful consideration of its flex areas, because it will break if it is restricted to flex in certain areas. 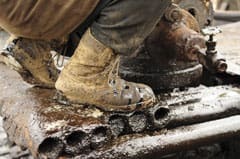 Most people's perception is that safety shoes are limited to the steel toecap footwear, but today we have many engineers and managers requiring safety footwear, as well as staff doing soft jobs that require specific footwear. I am currently developing a full safety range of footwear for an airport company, researching its entire staff function and developing safety footwear specific to different workers’ environments and footwear needs. From the person pushing the trolleys to the safety officer, each daily routine has been captured with all possible safety hazards taken into consideration to develop the perfect safety shoe for each environment and worker. Workers’ feet were even scanned and differing shapes and needs taken into consideration. This takes the safety footwear market into a much wider field of expertise and more specific for companies and their environments. With the modern technology available today as we have in our development studio, I believe that the safety industry will change considerably in the future. We are currently putting out tenders for our clients based on contracted manufacture only and we are providing lasts sole moulds, patterns and supplier’s details with specifications for footwear custom made to our client’s needs. By doing this the client gets environment specific footwear at costs far lower than ordinarily possible. This is also proving useful in the efforts to prevent imports into the country as clients have immediate replenishment, adaption of styling if necessary and of course the usual tax breaks.